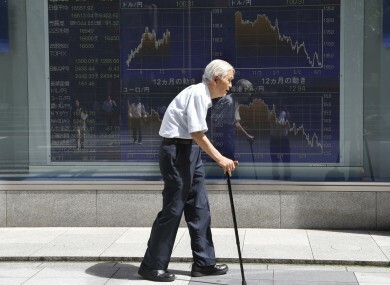 Nearly 5 million people aged 75 or older hold a licence in Japan. THE PROSPECT OF a cheaper funeral is being used to entice elderly Japanese drivers to give up their licences as police step up efforts to prevent accidents caused by ageing motorists. Deadly accidents involving elderly drivers are a growing problem in a country where the population is rapidly growing older and some 4.8 million people aged 75 or older hold a licence. In November, a six-year-old boy died and 11 others were injured after an 87-year-old driver’s pickup truck hit children walking to school in Yokohama, south of Tokyo. Japan this month introduced a new rule under which drivers aged 75 or older must pass cognitive tests when renewing their licences. Now, a funeral service company in central Japan has from this month started offering a 15% discount to elderly drivers who give up their permits. We’ve been offering funeral services to those who lost family members in car accidents. We want to help prevent deaths caused by such accidents. Ariga said the discount was offered after a request by the local police department in the city of Ichinomiya in Aichi prefecture where the funeral business is located. It is applied to altars used during funerals, Ariga said, adding that the elderly drivers can end up save a minimum of 56,000 yen (€470). The discount applies not just when the drivers who give up their licences die but even their close family members as well, he said. Police in Aichi in November started offering a ramen noodle discount to elderly drivers who give up their licences via a tie-up with a local restaurant chain. Email “Elderly Japanese people to be given cheaper funerals if they give up driving”. Feedback on “Elderly Japanese people to be given cheaper funerals if they give up driving”.